Galway East Tourism - Burrenbeo in East Galway, West of Ireland.Galway East Tourism - Burrenbeo in East Galway, West of Ireland. A multidimensional resource for the Burren region, promoting and supporting the sustainable management and use of the unique landscape and heritage of the Burren. This was how the Burren region - a dramatic outcrop of limestone encompassing 600 sq. km of north Clare and south Galway ? was described by an officer in one of the marauding armies of Oliver Cromwell some 350 years ago. Today, the Burren attracts far more favourable reviews from the legions of admirers who visit the region to explore what is widely considered to be Ireland?s flagship heritage landscape. The first thing one can safely say about the Burren is that it is a place apart. Often described as a ?lunar landscape?, the soaring terraces of exposed limestone which compromise the Burren provide a real contrast to the ?forty shades of green? for which Ireland?s ?Emerald Isle? is widely famed. Here, the limestone skeleton which underlies much of the Irish landscape is laid bare. Over time this soluble limestone has been sculpted by erosive rainwater to create an oasis of geological oddities, featuring labyrinthine cave systems, disappearing lakes (known as ?turloughs? ), and bizarrely dissected pavements composed of massive rectangular blocks called ?clints? dissected by cracks called ?grikes?. In spite of its ostensibly hostile appearance, the Burren has always proven attractive for settlement, with generations of farmers attracted by the light, dry soils, herb-rich flora and calcium-rich water. This history of settlement extends back almost six thousand years, and is eloquently reflected in the 5,800 years old Megalithic dolmen at Poulnabrone where evidence of Neolithic farming activity was uncovered. Later generations of farmers built hundreds of stone forts or cahers (and later castles) to keep their stock safe from wolves and thieves, and thousands of miles of stone walls to manage their herds. Today these, and many other monuments from many other generations, constitute probably the richest and best-preserved cultural landscape in Ireland. The Burren?s rocky hills also contain a superb ecology, featuring over three quarters of Ireland?s native flowering plants. The seasonal transformation of the ostensibly drab, barren uplands in winter into a multicoloured summer tapestry is indeed quite miraculous, so much so that it inspired Cistercian monks to dedicate, in 1198AD, their new Abbey in the Burren to Our Lady of the ?fertile rock? ? a fitting acknowledgement of the paradoxical natural richness of the rocky region. The annual appearance of this flora is heralded with the flowering, in late spring, of the beautiful blue spring gentian. A member of the region?s rare Arctic-Alpine flora which also includes the mountain avens, their presence in the Burren is all the more remarkable considering that plants of Mediterranean origin - such as the maidenhair fern and the irish orchid ? are also found here. 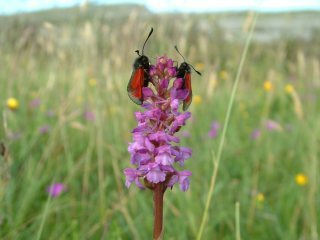 The Burren?s 20-odd orchid species are another favourite: though less showy than their equatorial counterparts they are nonetheless fascinating, as suggested by their names ? butterfly, bee, frog and fly orchids. There is one other aspect of the Burren worthy of note - this is the story of the people of the Burren, in particular the farmers, and their role in shaping this landscape and sustaining this heritage. Take the aforementioned flora for example: few visitors are aware of its dependency on the ancient agricultural tradition of winter grazing (?winterage?) that continues to be practised in the region. Under this unique system, animals graze the rocky Burren hills in winter, removing rank grasses, weeds and decayed vegetation, with the result that the often-minute Burren plants can flower unhindered the following summer. These livestock and their herders are, after a fashion, the ?unsung heroes? of the Burren ? without them the spectacular floral and archaeological heritage of the Burren would be greatly diminished, shrouded instead by a cover of hazed and blackthorn scrub. No doubt about it, the Burren is one truly special and unique place, a richly rewarding landscape for those who choose to explore it. The unique combination of geological, archaeological and ecological features found in the region are individually significant, collectively exceptional. Take some time to unlock the Burren?s many secrets and you won?t be disappointed - but please treat the Burren with the respect that it so richly deserves. More information at the Burrenbeo Resource Centre in Kinvara.